Forest Minister Govind Singh Thakur said that in order to create mass awareness regarding prevention and control of forest fires due to a prolonged dry spell in the state, ‘Rapid Forest Fire Fighting Force’ has been constituted with 13000 volunteers as its members. Besides, special events like rallies, chat shows, street plays, painting and slogan writing and exhibitions were organized to create wider awareness among the people regarding the forest fires precautions and the measures to be adopted in case of major forest fire. Two forest fighting vehicles have been provided to forest fire sensitive areas of the state. State government is also providing weapons to forest guards in a phased manner for which they would be provided a grant of Rs. 12,000. Licenses of the weapons will be in their names. The forest guards would also be provided safety devices like fire proof jackets, gloves and boots etc. for fire-fighting purpose. The government in order to ensure the active participation of local people have launched ‘Samudayik Van Samvardhan Yojna’ in the state under which empty forest lands will be allotted to villagers for plantation of useful plants and to look after other works related to forest produce, Similarly under Vidyarthi Van Mitra Yojana forest land will be allotted to the schools for plantation purpose. This scheme has been started with an aim to raise the spirit of conservation of forests and environment among the students. To create employment opportunities by selling wild herbs and promoting their production from private land the State government has started ‘Van Samridhi Jan Samridhi Yojana’. Under this scheme, arrangements have been made for the maintenance and marketing of wild herbs. To promote herbs based medicinal manufacturing industries and individual entrepreneurs a provision up to 25% subsidy has been made under this scheme. The State government would also set up industry for manufacture of products out of pine leafs for which 50 percent subsidy will be provided to manufacturers. 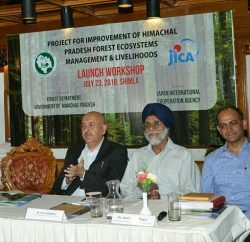 In order to connect the forest enhancement with livelihood, the ‘HP Forest Eco System Management & Livelihood Improvement’ project of Rs. 800 crores funded by JICA has been started in six districts viz Kullu, Mandi, Lahaul-Spiti, Bilaspur, Shimla and Kinnaur. Under the project, 460 committees would be constituted for promoting activities like forest and environmental protection, biodiversity and organism conservation and improvement in livelihood like activities would be encouraged. 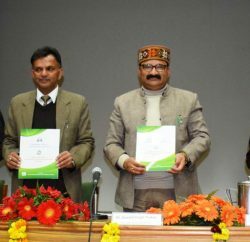 A Joint Forest Management and Public Forest Management Committees have also been constituted in State by the Forest Department. According to the latest report of Indian Forest Survey 2017, an increase of 393 sq km has been recorded in the forests of Himachal Pradesh and due to the judicial decisions taken by the government from time to time we are in the category of those states of the country where the growth in forest area has been recorded.